In every company, there’s always a schedule example that every single employee will need to adhere to. But, you can’t have these employees start working if you haven’t even come up with a proper shift schedule. Which is why you’re going to have to learn how to make one. You may also see Schedule Samples. So, let’s say that you require your employees to work at least 10 hours a day, this would mean you’re going to need to make a schedule that will tell your employees when they should come in and when they can leave. This article is going to teach you how to make your own 10-hour shift schedule sample for your company. 1. Start Microsoft Excel and click the “File” tab. 2. Once you’ve done that, go through it and click on the “New” option. 3. Double-click the “Schedules” button on the “Available Templates” screen. 4. Double-click the “Business Schedules” file folder icon. Once you’ve done that, go through all the different templates until you’ve found the one that you want to use. Click on the template that you’ve specifically chosen. 5. Click into one of the cells populated with a fictitious employees’ name. These would usually be located at the columns that are at the leftmost column. 6. Overwrite all of the fictitious names and replace them with the actual names of the employee that will be taking part in the 10-hour shift. 7. Repeat all the previous steps to add each employee that will be taking part in the 10-hour shift schedule. If you don’t need all the rows in the template, right-click on the row header of any unwanted row and select “Delete.” If you want to add more employees, then all you need to do is right-click on a row header, choose “Insert” to add a blank line and then type the name of the employee in the leftmost column. 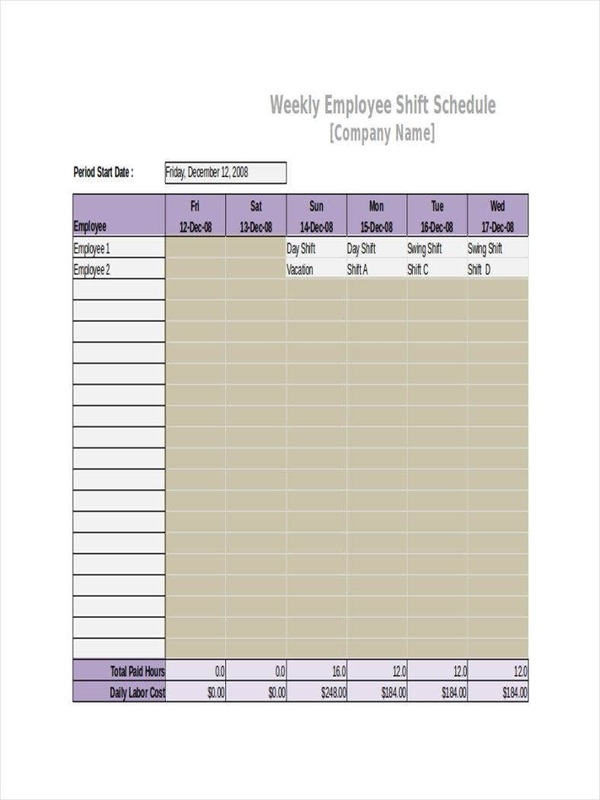 You may also see employee shift schedule templates. 8. If you didn’t add or delete any rows, then you are now ready to copy the cells with the employees’ names. Highlight the employee name cells in the next day of the week, right-click and select “Paste,” so that you can replace all of the fictitious names with the actual names of all the employees that will be participating in the shift. However, in the event that you did add or delete any rows, then you would need to add or delete corresponding rows in each daily section that’s in the shift schedule. 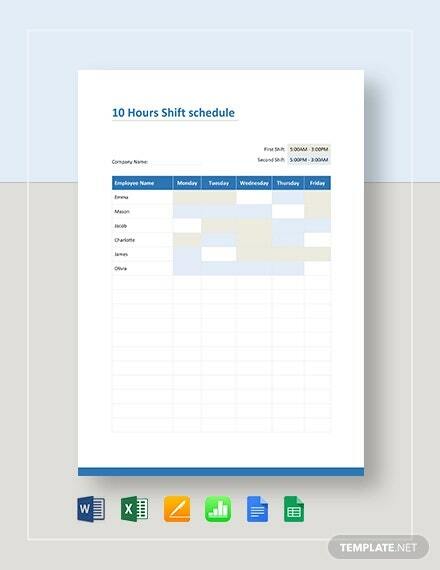 You may also see rotating shift schedule templates. 9. Usually, the templates you’ve downloaded would have the times run across the top of the schedule grid. If you wish to change these, then all you have to do is simply overwrite all the ones that you want to change. You may also like schedule templates in excel. 10. Premade templates always come with dummy information, meaning that you’ll have to delete all of them so you can make way for the pieces of information that you actually want the template to have. To do this, click in a cell that contains data and hit the delete key on your keyboard. You may also see 12 hours schedule templates. 11. Once you’re done with changing everything that you need to, then all you have to do is click on “File” and choose the “Save As” option. 12. Type a name for the schedule, preferably one which contains the shift schedule for that particular year. 13. Select where to save your new schedule. Once you’ve found the perfect place to save the schedule, then the last thing that you’ll need to do is click the “Save” button and you’re finally done. You may also see staff schedule templates. Now that you’ve learned the basics of how to create the shift or work schedule for your company, there are still a ton of things that you have to consider. A lot of managers strive to create that perfect schedule and only a few are actually able to do that. The reason as to why there are a lot of managers that aren’t able to do this is because they don’t utilize the technology that will help make creating and keeping track of whatever blank work schedule they decide to make. Also, it’s because some of them have no idea as to how to come up with an effective work schedule. Whether you use online scheduling apps, have your own tools like Excel, or rely on the pen-and-paper method, there are still a ton of important points that you’ll definitely have to keep in mind. So, here are the tips that should help you create your company’s perfect work/monthly shift schedule. This the most basic thing that you can possibly do as the one in charge of creating the shift schedule. By knowing the people that you’ll be managing and working with, you will get to understand their strengths, weaknesses and even their personalities; thus allowing you to know which employees should be in which time slot in the schedule. 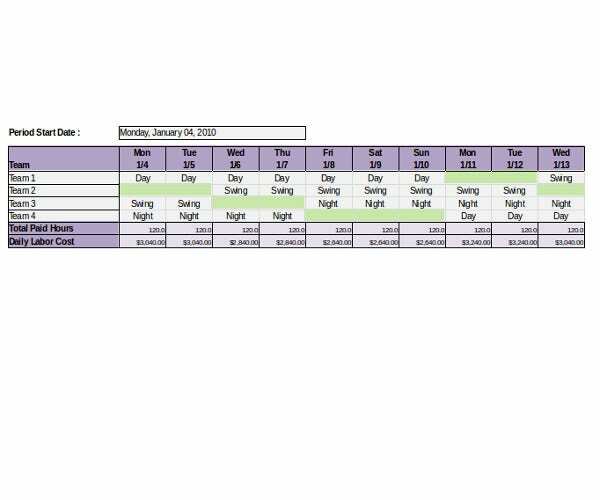 You may also see weekly schedule in excel. So, remember that it’s always important that you learn as much about the employees that will be working for you and the company as the information will be very valuable for when you have to come up with the shift. You may also see employee schedule templates. You have to consider which of your employees are the ones that have the most skill, experience, etc. You need to build shifts for your best employees and make sure that it’s set at a particular time. You may also see employee schedule templates. First, it ensures that the employee is most comfortable with the shift that you’ve assigned him/her to. The employee you consider to be the best at the job may just have particular working hours where he/she is able to do everything in a comfortable yet efficient manner. You want the employee to work during those hours so that you can make the most out of his/her abilities. 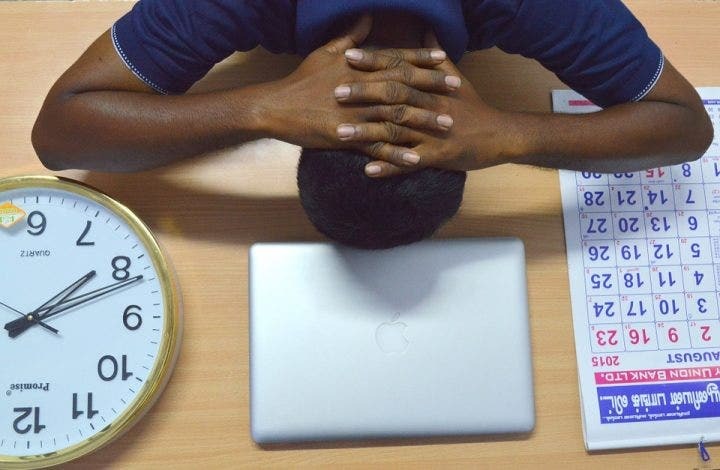 Because you don’t want an employee who just lazes around simply because he/she is still too tired, even though you consider him/her to be best suited for customer service work. The second reason is that by building a shift around your best employee means that you’re guaranteed one person who has all of the skills and knowledge needed to do the job right, as well as having a role model which all the other employees in that particular shift can rely on. An experienced employee can quickly improve the quality of a shift because other, less experienced, employees will be able to watch and learn to the point where they’ll be able to reach the level of quality that your best employee has to offer. This is especially true if you have brand new employees who are still fresh from the company’s employee training program and you want to show them the ropes as quickly and as effectively as possible. Let’s say that you’ve already established a shift schedule for all of your employees. This is the part where you’ll need to distribute it to all of your employees as soon as you’re able to. You want to do this as your employees may have other obligations which could prevent them from working that particular shift, so they’ll really appreciate if you’ll be able to send out the schedule as soon as possible. 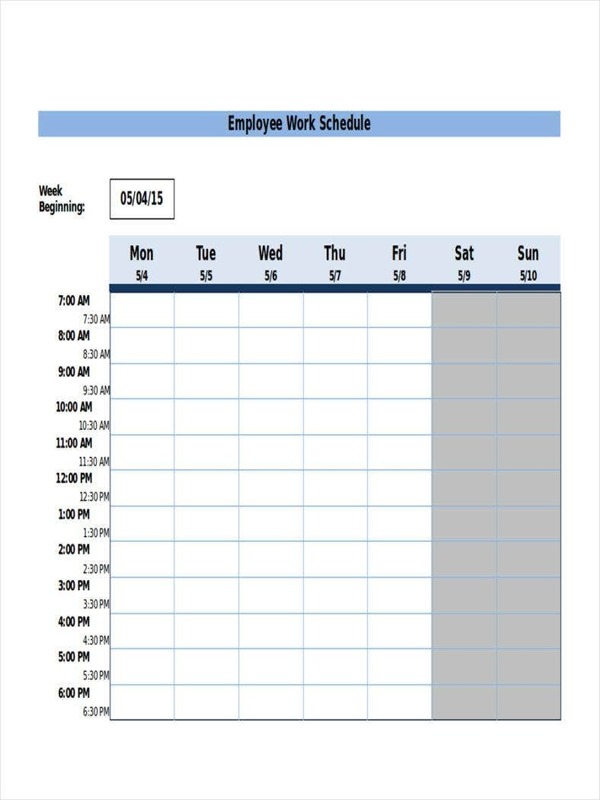 You may also like simple employee schedule templates. Schedule and reschedule personal commitments. Talk to you about the days and time that they can work or the ones that they’re most comfortable with. The easiest way that will allow you to distribute the schedule to your employees in the fastest way possible is through the use of a cloud-based app. These apps allow you to produce one document, post it online, as well as give your employees the access they need to be able to view the schedule at any given point in time. That’s much faster than trying to hand out a printed copy to each and every team member. Also, it’s really helpful as whenever you have to make enhancements to the schedule, all you have to do is make them and it should automatically update the document. You may also see weekly work schedule templates. It’s always better if the employees find their own substitutes rather than you having to do it for them. Giving your employees the responsibility to find a substitute to cover their shift when they can’t work is a good way to reduce your own workload. Also, it’s a good way for the employee to remember his/her responsibilities of needing to inform anyone within his/her group that he/she will not be able to make it work and that the employee will also need to find a proper substitute to cover the unmanned shift. You may also see blank schedule templates. If you would like to learn more in regards to making shift schedules or any other similar topic, then all you have to do is go through our site, find the articles that have the information you need and utilize what you’re able to gather to help you and your business out. You may also see flexible work schedule templates.